In May, the Harrington's made a quick yet enjoyable weekend trip to Tokyo, Japan were a dear friend was teaching English and being visited by additional dear friends. Mid-August, that same friend-who-teaches-English-in-Japan made her way to Daejeon, South Korea to crash the Harrington's couch and get a feel for the country they so dearly love. After conquering some poorly given directions and finding her way to Galma Station, Mandy enjoyed her first evening in South Korea around a game of Redneck Life with a handful of foreigners whom the Harrington's count among their dearest friends. Considering Melissa had two more days of obligatory summer camp instruction, Mandy enjoyed her first morning in the land of the Morning Calm sleeping in, wandering and awaiting the return of Melissa. 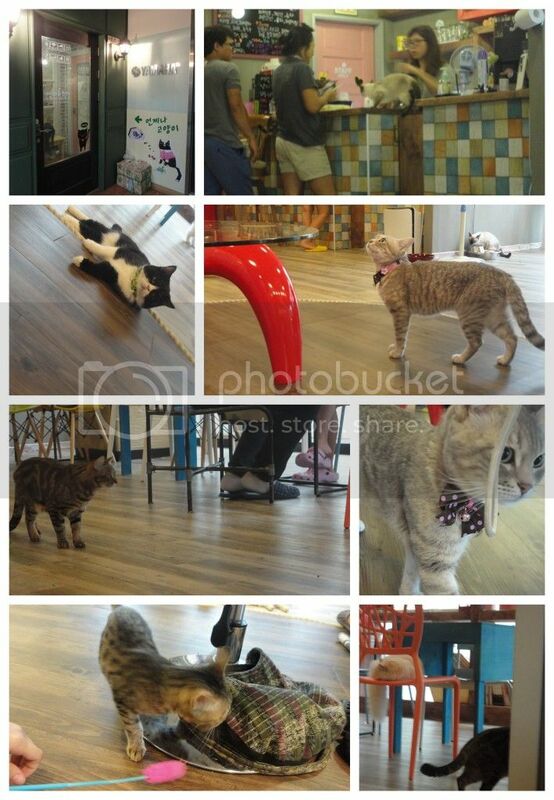 Upon the return of the hostess, the girls decided to explore a few wonders of Dunsan-dong and within moments found themselves entering one of Daejeon's 'Cat Cafe's'. Here, guests pay a flat rate to enjoy a complimentary drink (coffee, tea, lemonade, etc.) and the company of any cats which can be convinced to be social. Mandy and Melissa spent a majority of their visit calling out 'Here kitty, kitty' and waving random toys in the air while other customers put down some cash to purchase some cat treats and therefore be swarmed by these sweet little bundles of warmth and cuteness. Before allergies could settle in and cause problems for Melissa, the girls made their way to 5.5 Chuncheon Dalk-galbi restaurant where they joined Mike and Hyunhee for a fantastically spicy and delicious dinner. During dinner, as should be expected with Mike and Hyunhee sitting at the same table, the Korean card game of 'Go-Stop' was mentioned. Seeing how Mandy has seen a number of Korean drama's, she immediately recognized the name of the game and was a willing learner, leading to the continuation of the evening which took place at the Harrington's Galma abode. 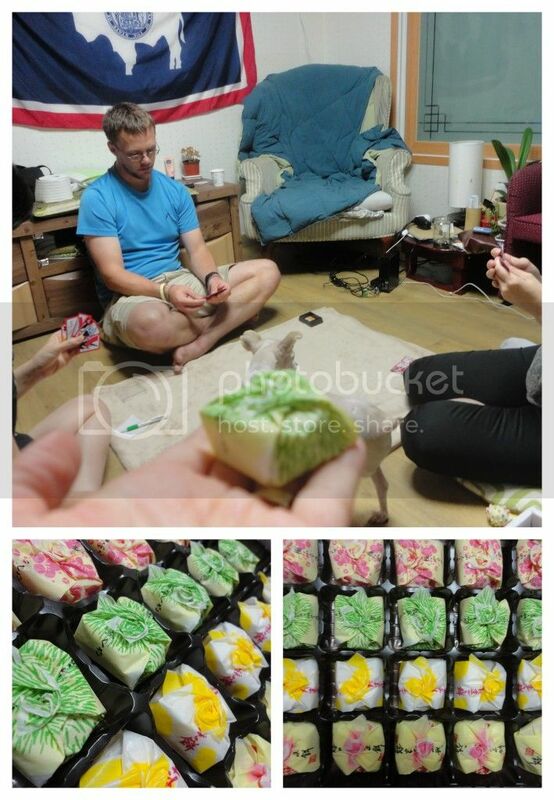 Never being one to play 'Go-Stop' and starting to feel a bit ill, Melissa opted make a plum cobbler for Hyunhee and snack on the mochi (rice cakes) which Mandy had brought from Japan. After a good nights sleep, the girls woke in the morning and both prepared to make their way to Samcheon Elementary school where Mandy would receive a small glimpse into the life and work of Native English Teacher's in Korea. Having been thoroughly entertained by student role-plays and Melissa having said her final good-bye to Samcheon Elementary school, the two girls returned to the Galma apartment for a short rest before heading to old down-town with Hyunhee. Unfortunately, Melissa continued to feel ill and was not the best of down-town shopping company. Fortunately, Hyunhee was able to offer her assistance and help Melissa acquire some medicine to ease the discomfort. Therefore, the afternoon progressed with Hyunhee and Mandy sharing a large bowl of Pat-bing-su and Melissa drinking hot tea. After a dinner of dalk-galbi leftovers and a few more rounds of Go-Stop the entire crew drifted off to sleep anticipating a road trip and full-out vacation glory when morning arrived.